As an Australian cycling fan, I have to open up this stage’s review with two words. 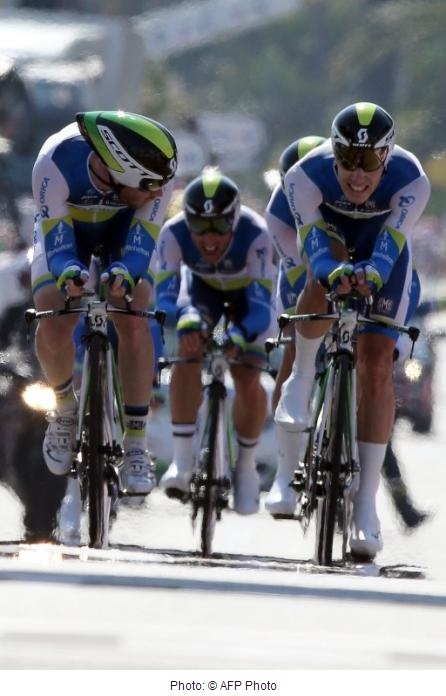 Orica GreenWedge have blown open the Tour with a stonking team time trial ride. And the competition was fierce. This was what a TTT should be for the Tour. The list of favourites for this stage were identified as a select few teams by the cycling journos in the know. The boys from the Death Star (Sky) were pretty hot favourites, but one of the stormtroopers had a chink in their armour (Geraint Thomas). The current Team TT world champs Omega-Pharma-Quickstep were in the mix (but their big guy was had been a pedalling Mummy – Tony Martin). Everyone was talking up Garmin-Sharp, but the journos should have looked more closely at the team of climbers they brought and the absence of Captain America (AKA DZ Nuts, AKA David Zabriskie). Even with Captain America missing, Garmin did have David Millar who was potentially thinking of wearing Yellow 13 years after the last time he did. BMC and Saxo-Tinkoff were also in the mix with both Evans and El Pistolero having some pretty big engines to support them in the race against the clock (Brookwalter and Rogers). The dark horse was the Orica GreenWedge team who have demonstrated discipline in the past of how to ride a Team TT. All the rest of the teams would be in damage limitation mode (and every cycling fan knows that Italian and Spanish teams can’t time trial, you could maybe throw French teams in the mix). The run order provided the perfect scenario for what was to unfold. Omega-Pharma-Quickstep were second out of the blocks and they absolutely belted it. The weather was perfect for the stage and would not be a factor. Their intermediate time would not be bested all afternoon and it was bloody quick. Where they really put in the crank work was in the second part of the course, stepping up a gear. The big callout goes to an angry Sylvain Chavanel and the pedalling Mummy who showed how big his stones were when he dons a skinsuit. Lotto Belisol were surprising in their speed and really challenged the favourites. Garmin Sharp hit the road. Their first intermediate split was only a shade off the OPQ boys, but they would have to dig deep to make up the deficit. It was not to be, and Millar missed out on Yellow. But with a reasonable enough time difference the Garmin GC candidates (all four of them) are right in the mix. This is going to be dangerous to the rest of the peloton in the coming weeks. The Evil Empire (Sky) were out on course not long after and were also pushing. Big respect to Geraint Thomas who pushed some big turns on the front until the final kilometer – job done, massive pain in the hip to recover from. The Froome-dog was now in the driver’s seat for the GC, but without Yellow on his back – perfect for him and the Empire. A bit more rubbish, until Saxo-Tinkoff hit the road. They pushed and for once Contador had a team that matched his TT ability. There may have been some imported meat at the finish line too, but that is naughty to talk like that. Ultimately they came up short too. The fifth from last team to hit the road was Orica GreenWedge who were hatching their grand plan to take the Maillot Jaune. A win for the team would put Gerro in Yellow. They were only three seconds down on the OPQ intermediate time. It was the second half of the ride and the final kilometer where the came good. They absolutely belted it in and beat OPQ by just 1 second on the line. The nervous wait would be really only to see what BMC would do. BMC were disappointing and both TJ and Evans dropped some 25 seconds on the Froome-dog. This will be a setback that might cause some problems later in the race. So Orica GreenWedge won their second stage in a row, have the Maillot Jeune on their back and laid some smack down against a very evenly matched field. Let’s be honest, the whole bus thing on stage 1 was all part of the plan to be in Yellow by the end of stage 4. I am calling it as the conspiracy that has worked. And the team owner, Gerry Ryan, can’t be happier. Aussie cycling fans are happy too (though the team I support is Garmin Sharp). Aussie cycling journos have had a huge bout of verbal diarrhea since the team has done well (when winning). There is a good chance that they will be in Yellow till we hit the mountains, so it is nothing but goodness. Bakelants had a good time for two days in the Maillot Jaune – respect. And big respect to Ted King who is obviously in great pain, and dropped off the Cannondale train within the first few kilometers. 1. Geraint Thomas – he is riding with a broken hip. Still showed great form. 2. Tony Martin – big crash in stage 1 has turned him into a pedalling Mummy. He was on fire yesterday and help OPQ to the 2nd rung on the day. 3. Ted King – also riding in huge pain. Unfortunately he has missed the cut off time for the stage and has been eliminated. 4. Peter “Tourminator” Sagan – the only one of the quick boys who has been able to overcome hilly rides to be in contention for a sprint at the end. 5. Jens Voigt – need I say more. He will always be on the list, it is just position that will change. Happy for my fellow bloggers to offer any other suggestions, though the assessment is highly scientific based on detailed assessment of every stage… who am I kidding – tell me your cement picks. I jumped on again, riding a shorter 30 minute stint. I might have to go for a spin on the road before the next stage as the weather is perfect, just cool. Four stages, four spins, 19 more to go. I can feel the endurance kicking into my legs, the base is getting there. After the bus debacle, what a great day for OG and Oz! All part of the master plan. Next will be Porte being appointed Team Leader of the Evil Empire and an Australian again takes the top step of the podium. I really like the gray jersey. Great post man. Should have told Prudhomme when I saw him. Drat, missed the chance.